Dr. Yoko Mizuta at the Graduate School of Science, Nagoya University has successfully improved a method to control genes in the pollen tube without gene modification. 1 Her paper has been published online in Plant Journal. When a pollen grain sticks to a pistil, a pollen tube grows from the grain towards the ovule carrying the sperm cells. The study of genes involved in pollen tube growth is anticipated to contribute to encouraging and discouraging plant breeding. Previously gene suppression methods using phosphorothioate antisense oligodeoxynucleotides (AS-ODNs) have been reported; however, they require lipofection, which is the process by which pollen absorbs AS-ODNs, and are costly and toxic. For this reason they have not been practically applied to food plants. Dr. Mizuta produced three different AS-ODNs to inhibit three different genes involved in pollen tube growth, and determined their optimum dosage and density. In the absorptive process of AS-ODNs by pollen, Dr. Mizuta succeeded in completing the process without a lipofection reagent, simply by adding AS-ODNs to culture media and dusting pollen on the media. Pollen tube growth from pollen with AS-ODNs was prominently disturbed. 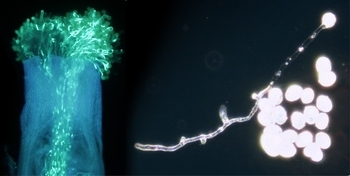 The method inhibits genes that are not only involved in but also disturb pollen tube growth. Therefore, it may contribute to promoting pollen tube growth and producing new varieties, thereby enhancing food production. The newly developed method much simplifies the process of pollen absorption of AS-ODNs, and is widely expected to be used in plant studies and to lead to higher efficiency. 1. The research is a part of Higashiyama Live-Holonics Project (Exporatory Research for Advanced Technology, funded by Japan Science and Technology Agency). 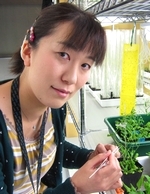 Dr. Yoko Mizuta has been interested in plants since childhood, and has studied them from various perspectives at various research institutes. She believes that her principle of continually tackling new topics in new places has broadened her research horizon. Her knowledge of painting and photography contributes to the sophisticated graphics and data in her academic output. Currently, she studies plants at Nagoya University as a researcher for the Higashiyama Live-Holonics Project, and devotes her efforts to introducing her research to the general public. Several genes play important roles in life, and there are several unexplained mysteries in the way genes work. I would like to enhance the method I developed in this research, and make it easy for everyone to examine genes in the pollen tube and apply this knowledge to agriculture and breeding. You might think research is very difficult and hesitate to undertake research although you have something you are interested in and would like to broaden your knowledge. I find it very appealing in research that I can discover what no one has ever known, and elucidate the underlying mechanisms of interesting phenomena, just like solving a puzzle. I hope you will find the field of interest to foster your creative research.